This science fiction police procedural pairs an idealistic rookie with an officer who uses cybernetic implants to process forensics; in solving a mass murder, they will uncover a vast conspiracy. Eric Matheson, an idealistic rookie cop trying to break from his powerful family, is plunged into the investigation of a brutal crime in his first weeks on the job in Angra Dastrelas, the corrupt capital city of the corporate-owned planet Gattis. A newcomer to the planet, Matheson is unaware of the danger he's courting when he's promoted in the field to assist the controversial Chief Investigating Forensic Officer, Inspector J. P. Dillal, the planet's first cybernetically enhanced investigator. Coming from a despised ethnic underclass, the brilliant and secretive Dillal seems determined to unravel the crime regardless of the consequences. The deeper they dig, the more dangerous the investigation becomes. But in a system where the cops enforce corporate will, instead of the law, the solution could expose Gattis's most shocking secrets and cost thousands of lives--including Matheson's and Dillal's. 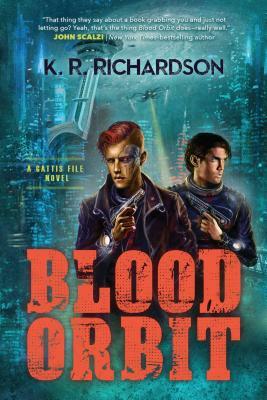 K. R. Richardson is a bestselling Washington-based writer and editor of science fiction, crime, mystery, and fantasy. A former journalist with publications on topics from technology, software, and security, to history, health, and precious metals, Richardson is also a lifelong fan of crime and mystery fiction, and films noir. When not writing or researching, the author may be found loafing about with dogs, riding motorcycles, shooting, or dabbling with paper automata. "A smooth blend of science fiction and police procedural. . . . [A setting] filled with potential, both narratively and thematically: an exotic planet fueled by corporate greed and the oppression of its native races."